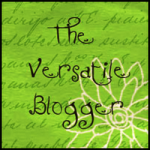 Recently I was honoured by Elaine of Following Augustine with the Versatile Blogger Award. I am always humbled when someone thinks of me for these things : ) Elaine is absolutely wonderful and her blog is an inspiration…and she's Canadian! 1. Thank the person who nominated you for the award and include a link to their blog. 2. Select and nominate 15 blogs that you’ve recently discovered or follow regularly. 3. Contact your chosen bloggers to let them know that you are nominating them for the award. I know time is precious and so I am going to modify numbers 2 and 4 I am only going to be doing 2 of each. Its not that there arent many wonderful bloggers out there, or that I don’t have 7 wonderful things to say, I just know it can be a lot to add so many new people and bloggers to the blog roll. But here are a few of my inspirations of late. 1. Tin Foils Tiaras a wonderful Ottawa blogger who discusses fashion on a budget! 2. Sunny Days and Starry Nights a constant source or love, inspiration and pinterest pictures! And now 2 things you don't know about me. 1. I could eat eggs for every meal if it were possible. What have you done lately to pay it forward? Congrats on the award, girly! :) I'm so happy for you. Wow! Thanks so much. You are so darling. I always find these posts so interesting because bloggers share things you would never think of... I've never eaten eggs and can't imagine wanting to, it's makes me smile to read about someone who is on the completely opposite end of the spectrum on the subject. That's what keeps life interesting! Thanks for the award N- that's so sweet! :) I'm not a big eggs gal- I like a soft boiled egg on occasion but if I had to eat something for every meal it would prob be cilantro- my current obsession!